Green-fingered communities across England can bid for a share of £1 million fund from today (5 December 2018) to help develop their own ‘pocket parks’. "Green spaces offer people a sanctuary away from the hustle and bustle of life to relax, keep healthy, learn about nature or spend time together with loved ones. "Not all communities enjoy access to an abundance of usable space, while some existing parks might need a bit of TLC to bring them back to life. The pocket parks plus fund will help local people to create and maintain small oases that they can take pride in and benefit from for years to come." The Ministry of Housing, Communities and Local Government welcomes grant applications for the creation of innovative as well as traditional pocket parks. 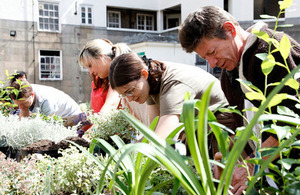 The first Pocket Parks programme was launched in February 2016. Pocket parks are defined for this programme as a piece of land of up to 0.4 hectares, although many are around 0.02 hectares – the size of a tennis court. Each pocket park will be an individual space tailored to the needs of the local area by the community group which has applied for the grant. To apply, read the prospectus and download an application form. Return the completed form to pocketparkplus@communities.gov.uk. Applications must be received by 5pm on Friday 25 January 2019.